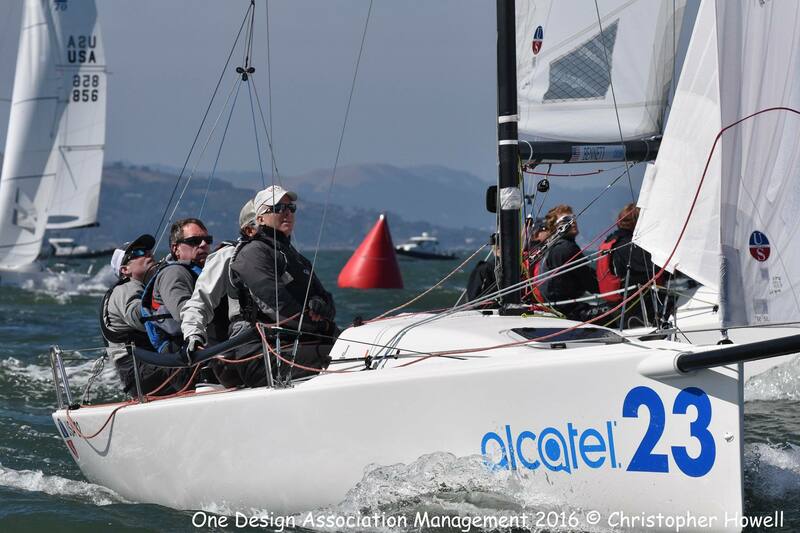 The 2016 Alcatel J70 World Championship, hosted by the St. Francis Yacht Club, was one for the ages. 68 competitors from 15 countries gathered on the famous Berkeley Circle for five days of intense competition. The competition within the regatta was fierce. Some of the notable sailors were Americas Cup competitors, Olympic medal winners, and many of the top professional and amateur teams in the world. Two titles were being fought for during this event. The Open and Corinthian titles were respectively being challenged for by eager teams who have been practicing and training over the 2016 season. Both titles are demanding and rewarding in their own right but could a Corinthian team capture both?? The 12-race format emphasized consistency, as well as physical endurance. The Ullman Sails J70 team of representatives had put in the time during the summer preparing for the regatta and their preparation showed. The practice and measurement days sent everyone into frenzy due to the hot temperatures and light air conditions. With temperatures in the upper 90’s and the sea breeze not kicking in until late evening, it looked like it was going to be a long week of waiting around. With the practice time being limited and the stress of measurement, many out of town sailors did not feel adequately prepared for the upcoming grind. To the pleasant surprise of the sailors, day one started with the stereotypical San Francisco bay conditions, fog and cold temperatures, which meant the big breeze was in the forecast! Those hot air days felt like a millennium ago as the fleet sailed two races in over 20 knots and low air temperature, which left the teams extra wet and extra cold. This led to the experienced teams moving into the front of the pack. Joel Ronning’s team on Catapult, Julian Fernadez Neckelmann and crew on Flojito Y Cooperando, and Jud Smith’s team, Africa, set the pace, followed closely by the Italians sailing Petit Terrible. The following day again emphasized heavy air boat handling and speed, as sailors sailed three races in over 20 knots, two of them over 25 knots. This, coupled with the hour and a half sail back to the harbor in a full ebb tide and blustery conditions, started to wear on the sailors. With three days to go, it was clear that the winning team would have to be both physically and mentally fit. Julian Fernandez Neckelmann’s team, Flojito Y Cooperando, sailing as defending J-70 World Champions, put the hammer down and won the day with two firsts and a fourth. The sailors woke up to more breeze on the third day of the regatta. The mark roundings were getting tighter each race as the sailors became more comfortable in the breezy conditions. There were big wipe outs and big collisions which emphasized sailing clean. Many of the teams had coped with a “U flag” OCS penalty which meant there was little room for error. For teams with aspirations of collecting silver at the end of the regatta, consistency started to show how important it really was. 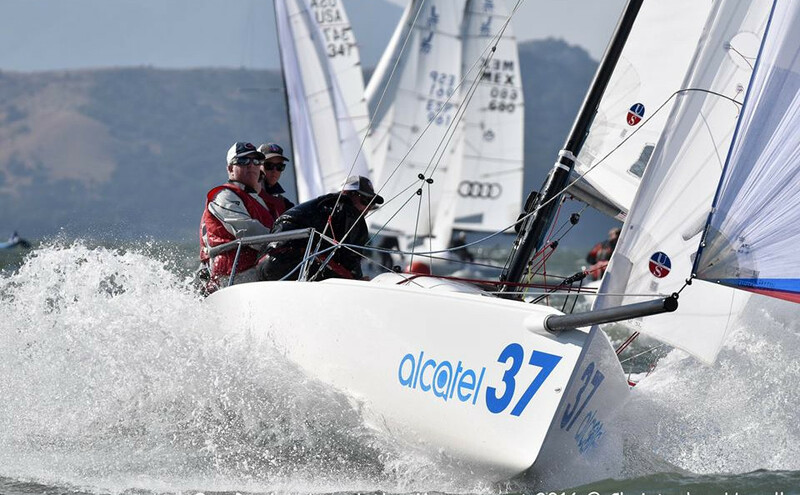 Team Catapult (Ronning) sailed the most consistent day to grab the overall lead back from the Team Flojito Y Cooperando (Fernandez Neckelmann). The penultimate day greeted the sailors with lighter winds and slightly warmer temperatures. Teams were forced to shift gears and get off the line in the light air and flood tide. The lighter breeze allowed for different teams to mix it up in the front of the pack. The second race was abandoned due to a massive left shift which led to a very skewed race course. The restart was sailed once again, in over 20 knots and a full ebb tide. It was a game of chutes and ladders on the race course with big pressure differences and wind shifts. “There were some runs where you could easily gain or lose 20-25 boats,” said Ullman Sails Newport Beach One Design Coordinator, Alex Curtiss. After a few general recalls, the U-Flag once again warded competitors off the starting line. 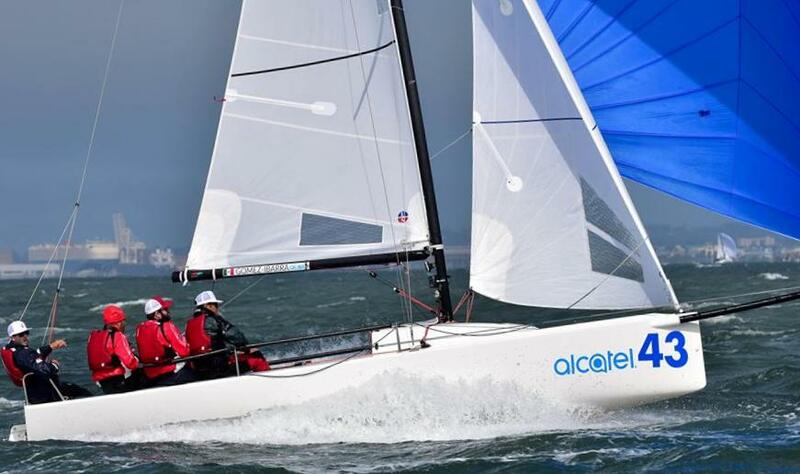 By the end of the day, Joel Ronning’s team, Catapult, was sitting atop the leader-board heading into the final day of the Alcatel J70 Worlds. The final day looked to be a beautiful day of sailing from the start. The racers started the first of two races in lighter breeze, similar to day four. Jud Smith’s Africa took off after the start and lead the whole way around the course. This shot them back into contention for the world championship. Africa (Smith) was now 25 points behind leader, Catapult (Ronning), who was carrying a U-flag penalty, and 10 points behind defending champion, Flojito Y Cooperando (Fernandez Neckelmann). This set up a three horse sprint heading into the final race. The westerly sea breeze filled for the last time of the week and the sailors took off. Flojito Y Cooperando and Catapult had a small match race up the first beat, but with Africa in the front of the fleet. All three teams fought against each other trying to edge the other out, however they finished in the front of the fleet. In the end, Joel Ronning’s Catapult took the win, while 2015 World Champion Flojito Y Cooperando (Fernandez Neckelmann) using the Ullman Sails Radial Head Main finished second, while Judd Smith’s Africa, finished third. Winning the Corinthian division was Ullman Sails Newport Beach’s own USA 32 skipped by Shawn Bennett. USA 32 sailed with the newest main developed for the 2016 Worlds, the Worlds Radial Head Main, as well as the brand new J2 SF Jib, and Step AirX650 Spinnaker. Finishing second in the Corinithian Division was Ullman Sails England team, Spitfire, skippered by Simon Ling, helmed by Ian Southworth. They also used the Ullman Sails Radial Head Main and J1V2 Jib. When setting up the boat and sails to receive max speed, point, and power, the clear and easy choice was using the Ullman Sails J70 lineup. The sails are plug and play! This is a major opportunity for the non-professional Corinthian teams to take advantage of. Using the new Ullman Sails and updated rig tuning notes will help lead all teams to success. Next up are the Hot Rum’s in San Diego, the California Winter Series, and the Florida J70 swing.